I may be an anachronistic gardener, stuck in my own time. I'm not taken in much by new gardening products. I saw a new product today - a peat pot already pre-planted with a seed, fertilizer included. Just tear off the paper lid and plant the whole thing in the garden and you will have planted the seed. For $1.25 each. One of the vegetables offered was bush beans. You do the math on what it would cost to plant a row of beans using those silly pre-planted peat pots. I'll just tear open a packet of seeds and plant them directly into the ground the old-fashioned way. I like to read old gardening books. They are charming and have personalities to them. I learn from them. I enjoy them. They weren't mass produced nor likely widely read. Each time I open an old gardening book, I'm certain that an old idea, a good idea, will come to light and make me a better gardener. I'm leery of new, improved varieties of vegetables, generally choosing heirloom varieties if they are offered. I like to think I'm growing the food my grandparents grew. I actually garden. I get my hands dirty, and end up with grass-stained knees and smears of dirt on the front of my shirt and across my forehead. If all this evidence convicts me of being an anachronistic gardener, someone who seems to cling to the past, so be it. I know no other way to garden and hope to never plant a seed by buying a pre-planted peat pot and shoving it into the ground. Maybe I'll start a club, a society -- The Loyal Order of Anachronistic Gardeners. Who wants to join? We'll buy packets of heirloom seeds to plant the old-fashioned way, and together read the old books to resurrect the old ways of gardening. I was in Home Depot the other day with my kids and of course had to stop and look at the packets of seeds. While there an employee tried his hardest to sell me those pre-planted peat pots, saying how great it was for the kids and trying to get me to follow him to where they were. When I saw them I was equally horrified at the price. Hmm, I could buy two of those new pods, or a regular packet with many, many more seeds in them... let's do some math.. The employee kept talking about how clean and easy the pots are for kids. Mister, kids like playing in the dirt! That's half the fun! I feel the same way. Really no need for all the fancy new gadgets. If I didn't come in with leaves in my hair or mud on my shoes what would be the point? It's about getting our hands dirty and doing it the old fashioned way. I will join your club. Well, I am an old-fashioned gardener in some respects, but not all. Yes, I use a manually powered shovel in my garden, but if I need to identify a bug, it's a toss-up whether I will look online or in my bug book. And for many years, the only way I could meet other gardeners was online. Thank goodness for garden blogs! I'm not going to throw the baby out with the bath water, the old or the new. 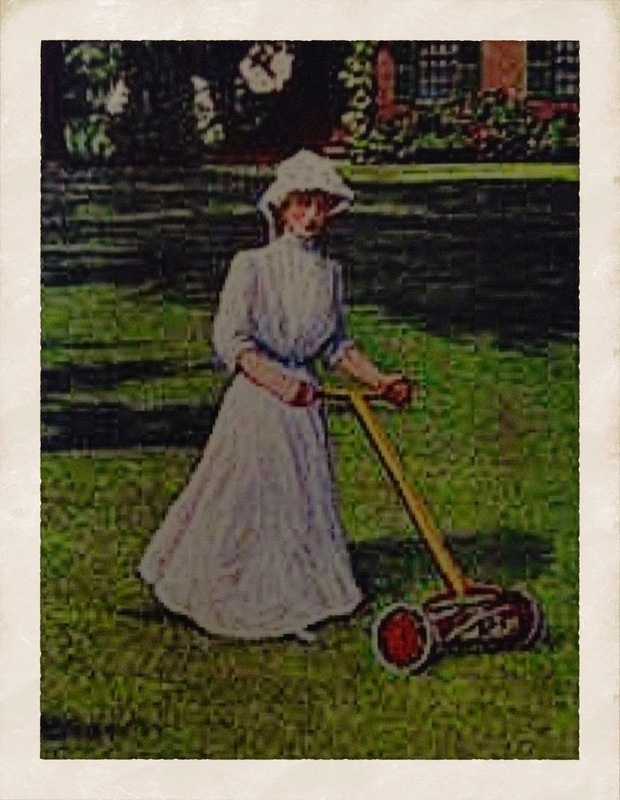 I think all proper gardeners feel the way you do. I seem to have more gardening clothes than smart or even everyday clothes. If I want to know if someone is a real gardener or not I check their finger nails. If they are beautifully manicured and polished you know they are not the genuine thing. Grubbing around in the mud is what we do. Sounds like a perfect society for me to join! I hate noisy machines, tend to handweed the little bit of lawn we have, only grow plants that don't require any special coddling and absolutely LOVE heirloom vegetables. Count me in! I dare anyone to look at my hands and nails and tell me I'm not an anachronistic gardener. I've got a bin full of garden clothes, but I am not opposed to a new tool or two - now and then. Cobrahead! I still love playing in the dirt.